STRONACH TWP. â€” A handful of steelhead flop in shallow water in a stainless steel bin, sending slimy splashes of water over Michigan Department of Natural Resources personnel, zipped up tight in raingear and waders. MANITOWOC â€” While the quality of brown trout fishing on Lake Michigan has ebbed in recent years, opportunities have improved for near-shore rainbow trout anglers along Wisconsin's eastern shore. 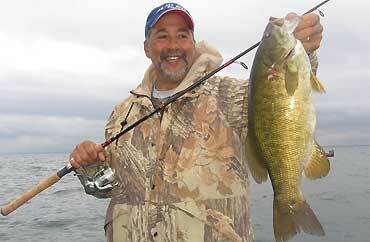 Just sending a quick reminder about my Fly Fishing Lake St Clair Presentation at Hanks Flyshop in Novi Mi. this Thursday April 5th at 7pm. Winter is quickly fading and its almost time to start another world class warm water fly fishing season on Michiganâ€™s Lake St Clair. The ice on the inland lakes has almost melted and the great lakes ice is starting to break up. Vast ice flows are now being pushed down from Lake Huron through the St Clair River into Lake St Clair which is a clear sign spring is almost here. One of the best indicators of what to expect for spring steelhead, walleye and sucker fishing in Michigan is something that happens in Ohio. It's the huge annual walleye run in the Maumee River, and anglers at Maumee say it's about to kick into high gear. On the shore of Lake Superior, about thirteen miles due west of Whitefish Point, lies the ruins of the old Coast Guard Vermilion Point Life Saving Station. The last time that I visited that site, it was being restored by Lake Superior State University as an environmental research facility. Years ago, right around 1969 or 70, I used to fly fish for brook trout in a short tiny stream near the station. How many times have you given up on a big bed-fish because you couldn't get it to react to a big bait. Maybe a smaller-profile presentation was all that was needed to get that fish to bite. "A lot of times, I'll take a finesse approach to finicky bed-fish," said 2nd-year Bassmaster Elite Series pro Jared Lintner of California. "If you throw a dropshot rig out there on a little bit heavier line, they might eat that better than they will a conventional tube or a swimbait. On Oct. 24, 2006, fisheries agencies throughout the Great Lakes area were presented a new federal order that profoundly impacted recreational and tournament angling within and around their borders. With the best of spring steelhead fishing upon us, fly and spin fishermen can take advantage of the double-nymph technique perfected here in Michigan about 30 years ago. Simply put, fly fishing makes it possible for an angler to deliver his lure, or other form of bait, to a specific location in a unique fashion, using only the momentum created from the fishing line. And that, in a paragraph, may be the best way to summarize the sport. Moreover, that definition may be the simplest thing about the sport. The open-water fishing fan of northern pike could get a bit discouraged after taking a close look at Michigan's Master Angler Award list. From lakes that have produced multiple Master Angler-class pike in the last few years, most of the trophy fish have come through the ice, not from open water. Tip-ups and spears did most of the work, not crankbaits and spoons.